Some of you may have heard of Azure Site Recovery (ASR) but haven’t had a chance to gain a deeper understand of it yet. Today, we will help you explore ASR as a DRaaS solution. 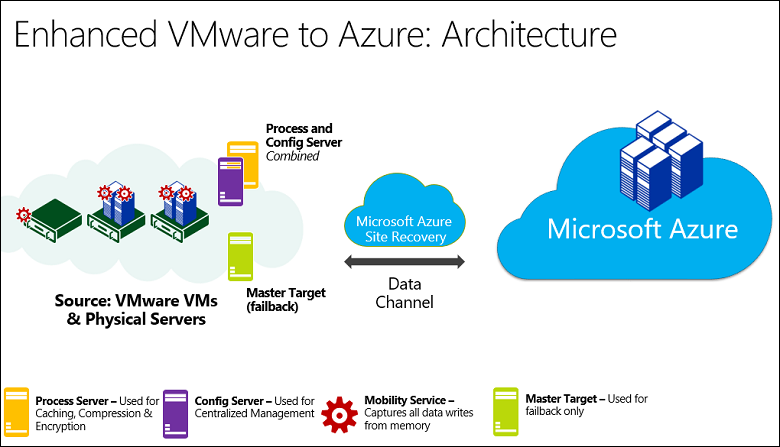 Microsoft Azure offers you the ability to failover your on-premise virtual machines running on VMware over to the Azure cloud with synchronous replication using an Azure Site Recovery (ASR). It also offers you the ability to failover VMware virtual machines from one of your data centers to another one. We will mainly focus on using ASR as a DRaaS solution in this blog! There are several on-premise components to accomplish replication and failover/failback processes. The Mobility Service agent gets deployed onto your Windows Server (64 bit) or Linux (CentOS, SUSE, OEL) VMs. It captures all written data from your protected virtual machine’s memory, then it will send that data to your Process Server which handles the replication to Azure cloud. By default, a Config Server comes with 2 other roles: Process Server and Master Target Server. Replication traffic goes over your internet connection, but you can also use Azure ExpressRoute public peering (sorry, site-site VPN isn’t supported yet). NOTE: you can failback from an Azure VM back to your on-premise physical server. It has to failback to a VMware virtual machine. As you can imagine, this is a robust yet flexible solution allowing for Azure’s DRaaS and cloud migrations! Please feel free to contact APEXIS Solution Architects (Rob@APEXIS.com) if you would like to have a further discussion on DRaaS solutions. Next time, we will discuss ASR’s ability to perform disaster recovery or VM migrations from one VMware vSphere datacenter to a secondary one.